No pink coffee but Detroit Bold can be Pretty in Pink! The color of pink and the month of October go hand in hand with an awareness campaign primarily for breast cancer in women. Its worn universally by all people and serves as a reminder to those we love and have loved to be aware, visit your doctor, and make sure we don’t forget. 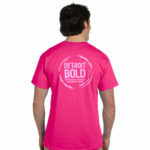 When you buy a pink Detroit Bold awareness shirt for $9.99, you’ll not only look fly, you’ll be a reminder, And, we’ll donate 10% to the Barbara Ann Karmanos Cancer Institute in Detroit for cancer research. Order up your pink shirt and your favorite blend of Detroit Bold here!